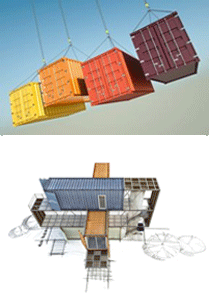 I read a few articles about container living or 'shipping container housing'. It took me about five minutes to realize this subject makes your mind frolic endlessly on an imaginary (however not utopian) land. Those articles belong to some very respectable gentlemen (at least that was the impression they made on me, at first reading) – that praise living in shipping containers. A 40 foot-long shipping container could reach to $1,500-2,000. I started asking myself questions about how container living could become a solution for homeless people in Romania (that's where I live), whereflats cost (at least) $20,000. And they're not 40 foot-long. A few advantages of container living from a Romanian point of view: for peripherals it's cheap, for artists it's unconventionalthe subject is quite green you can "camp" anywhere you want (Romania has not few spectacular landmarks)the result you get using shipping containers can be anywhere between "plastic" and "platinum", practical and fantasy, serious and ludic - you can move your "house" around. At least that's what LOT/EK people are trying to prove by their "mobile dwelling unit" project. Earthquakes, floods and sliding land are some serious problems in Romania, so being able to leave the place at a snail's pace may be useful. Most Romanians live in blocks of flats that pretty much look like overcrowded shipping containers (and usually inadequate to modern standards: water supply, heating, insulation, comfort etc). Could container actually mean a reasonable escape? Maybe, if they are properly transformed and adapted to living conditions. A sad fact is that few Romanians actually have the possibility to pay $2,000 cash for a house-to-be. A few observations to Mr Doug Casey's reportage about his Romanian adventure (www.escapeartist.com/efam17/Romania.html). Given the reasons Mr. Casey liked Romania, I quickly made some "counts". The average Romanian needs to work (at a medium economy salary rate of $11 per day) 2272 days to buy an apartment; or, 103 months (I excluded weekend days of course, they don't pay); or 9 years. This without considering any interest. And supposing that this particular individual doesn't eat, dress or pay rent. That takes me back to the initial idea that container living is a subject that gives you some chalk drawn-squares (or parallelepipeds in our case) that make you want to play like kids do with their Lego pieces. How much do utilities cost (water, energy, gas supply etc. )?